Oklahoma! is one of those great classics of mainstream American culture that has been honoured and parodied so much that modern audiences may be offput by that status. However, to watch this play by the Musical Theatre Productions company is to experience a show with not only fine music, but also surprisingly effective comedy and drama in the bargain. In 1906 Oklahoma territory, a young rancher named Curly (Joshua Clemenger) is hoping to take Laurey (Meaghan Sider) out to the dance, but she is playing hard to get by asking the rough farmhand, Jud (Dale Hirlehey), first. Meanwhile, farmhand Will Parker (Patrick Bowman) is out to finally win the hand of the fickle Ado Annie (Lucy Morgan) with his prize money, only to waste it on presents while Ado Annie manoeuvres peddler Ali Hakeem (Greg Mizon) into proposing first. These two struggles form the basis of parallel rivalries in the small town that will require more will, wits and heart to overcome than anyone suspects. This play was a major innovation in the 1940s with the near seamless integration of its drama and musical numbers, but the endless parodying on shows like Tiny Toon Adventures and Sesame Street has stained its image by presenting it as a lightweight piece of musical fluff. However, I was surprised at how there is so much more to this play, with a main plot that is surprisingly dark and morally complex for an early 1940s musical. After all, we have a main story where a woman’s teasing manipulations escalate beyond her control into tragedy. Illustrating that, the plot takes a slightly macabre tone when Curly shows what he is willing to do to get Jud out of the way, and Clemenger manages to keep an essential innocence to the hijinks even as you realize what his character is attempting. That chicanery is neatly counterbalanced with the auction scene in which Curly shows how determined he is willing to sacrifice for love, even when it means throwing his livelihood away. The result is a plot that can be interpreted as a tragedy, despite the supposedly happy ending made possible by a complicit community, that young Laurey forever has to live with causing. Sider is more than up to the task of making the dramatic weight of being a young woman who starts this conflict believable, only to look on in horror as its consequences begin to fall around her home and her own mind. Dale Hirlehey seals that thematic deal as Jud, the nominal villain of the story, with just the right amount of sympathy reinforced with a masterful rendition of Lonely Room . 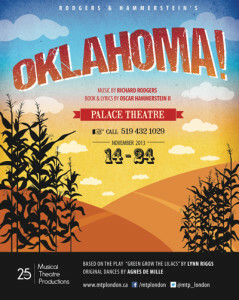 Furthermore, this play was written barely ten years after Oklahoma was devastated in the dust bowl drought, making the characters’ singing of the title song a bittersweet quality in itself with the ruin to come. That is a kind of narrative complexity one would normally associate with more modern musicals like Cabaret , and it speaks well of this play’s virtues. That said, the show has some fine humour, made possible with Mizon as Ali Hakim, a Middle Eastern peddler who finds himself in the most awkward situations because of his philandering. Seeing Mizon artfully squirm as an outsider more welcome than he would prefer and then take maximum advantage of surrounding events to escape is a master work of character comedy that feels ahead of its time. Compared to that performance, Morgan and Bowman are perfect to frame this business as both manipulator and dupe whom Ali has to massage together for his own peace of mind. As such, the subplot is the perfect thematic counterbalance to the main plot’s heaviness, with such success that the whole superficial public image actually becomes understandable. Acting as support, Joanne Grivich and Dean Gregory are ideal as the respected matriarch Aunt Eller and the hot blooded Andrew Carnes, two pillars of the western community trying to maintain some peace by their own definition in their communities. Furthermore, the music is as wonderful as the play’s reputation holds with the angelic Oh, What a Beautiful Mornin’ and the rousing showstopper title song being just the most obvious ones. In addition, It’s A Scandal It’s an Outrage is a gloriously tuneful piece of comedic fun with Mizon showing off his musical skill for all to see. Furthermore, Laurey’s dream scene is a ballet with an effective nightmarish tone that would challenge all the frothy assumptions of the show easily. That same attention to choreography is evident in the regular numbers as the players perform with a polished professionalism worthy of the Grand Theatre stage. The stagecraft is of a classic design that allows the right bridging of the imagination as it creates the Oklahoma Territory with an artful collection of props both simple and elaborate. For instance, the forced perspective facade for the interior of Jud’s shack neatly creates the setting without complicated construction. Furthermore, the carriage at the very end is a beautiful payoff for the opening scene’s dialogue as expectations and hopes were raised against reality. Finally, the costuming is beautiful in the way it evokes its western theme, such as Jud dressed in his black best for his hopeless romantic ambitions. However, Mizon’s easily stands out: a beautifully ornate suit that perfectly fits a man who depends on first impressions for his livelihood. That in turn makes his outsider status all the more effective as he struggles to function amid the cowboys and ranchers and does better than you’d ever expect. Mainstream American musicals before the 1960s have a reputation of being lightweight entertainment. This play proved my assumptions wrong, as a classic with much more artistic complexity and ambition than I ever expected from its era.